This guide will walk you through setting up the Cocina theme. Cocina uses two post thumbnail sizes. An image size of 800×800 is used for posts displayed the Featured Content area. The images in the Featured section are 800×800. An image size of 350×350 is used for portfolio items and blog posts displayed on archive pages. All other featured images are sized at 350×350. You can set the Featured Image on the post edit screen. Cocina features four widget areas, one in the sidebar, and three in the footer (one for each column). Cocina widget settings on the demo site. Note that the footer widgets are Flexible Footer Widgets, so if you only use two out of three of the available footer widget areas, Cocina will automatically adjust the column widths to halves rather than thirds. 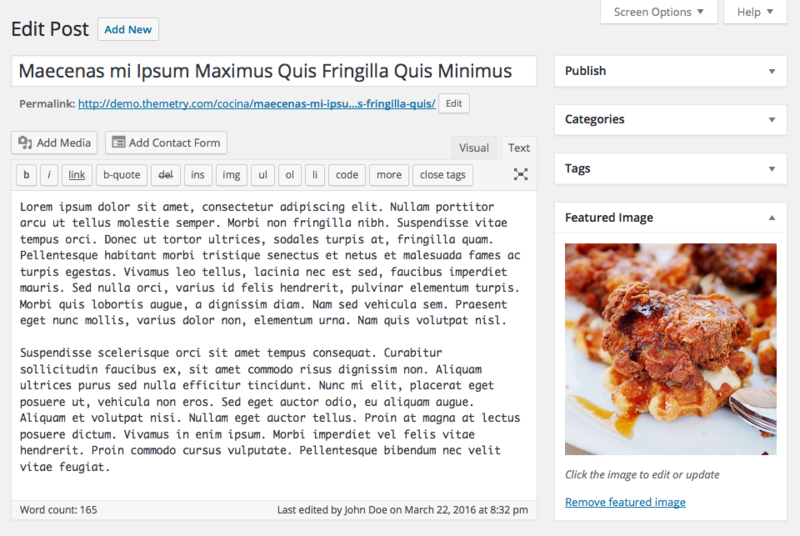 Three columns of footer widgets in Cocina. If the sidebar widget area is not active, Cocina will automatically adjust to a one-column layout. Cocina features three menu locations: the main navigation in the header, the social navigation next to the search box at the top of the theme, and the footer menu. The main navigation menu supports two levels of submenus. For more information on using the social navigation menu, please see our documentation article titled Social Menus. The footer menu, displayed directly to the right of the credit text, supports only one level of navigation. The Cocina footer menu, best used for links to supplemental content like legal disclaimers. Like all of our themes, Cocina contains support for certain modules in the free Jetpack plugin. 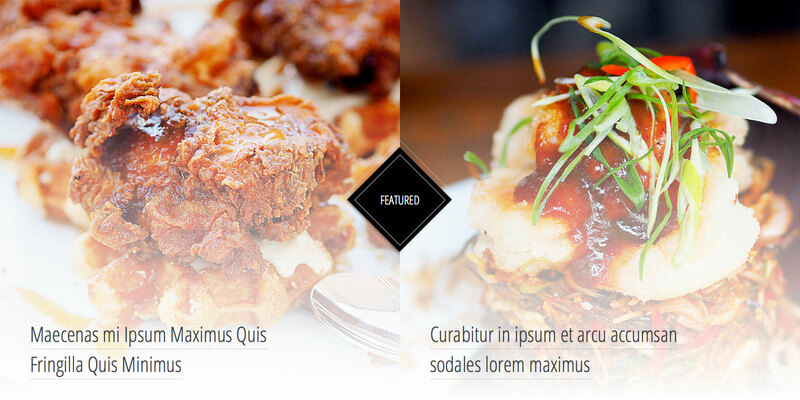 Cocina supports Infinite Scroll, Featured Content, Site Logo, and the Portfolio content type. Simply activate the Infinite Scroll module, and Cocina will handle the rest. Upon activation, the numbered pagination as currently seen on the Cocina demo site will be replaced with an infinite scrolling mechanism. You may uncheck the “Scroll Infinitely” box on the Settings → Reading page to have this replaced with a clickable “Load More” button. For more information, please see our documentation article on how to enable Jetpack Infinite Scroll. Featured Content is visible on the blog homepage. It will display the two latest posts in the tags you designate as “Featured” in the Customizer. Cocina can display an optional logo in the header area of the design. Note that a custom logo is not visible on the demo site. 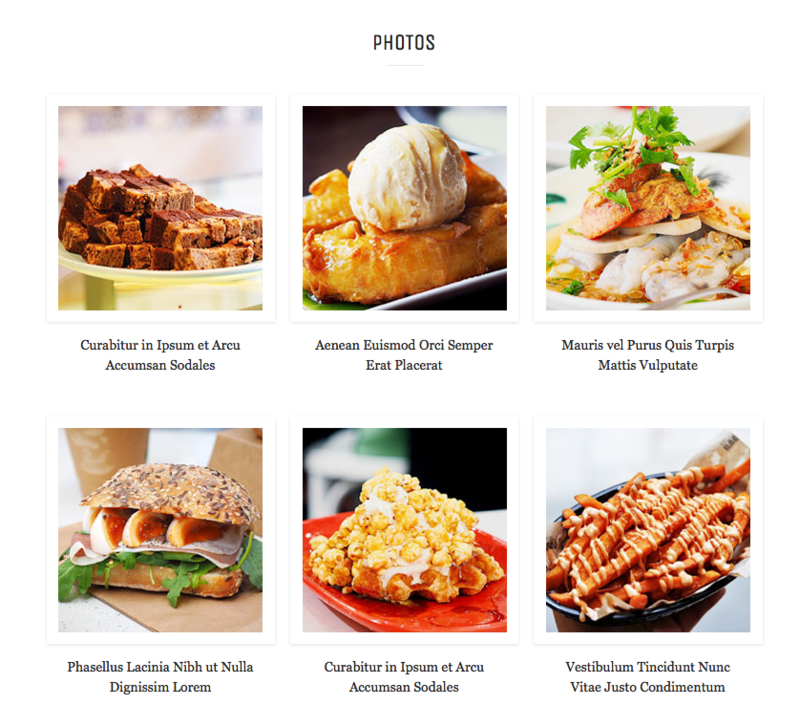 Cocina uses Jetpack’s portfolio content type to display the section of “Photos” above the blog post index. This section will display a maximum of the six latest portfolio pieces. The full portfolio page will be displayed at yoursiteurl.com/portfolio/ which you can link to through any menu.